This article was originally published at FAIR.org. Used by permission. Nationwide, marijuana legalization is becoming more normal. Colorado’s dispensaries are hailed as an economic success story, and other states are following suit — New York Gov. Andrew Cuomo has indicated he’ll support legalization after New York City’s choice to gradually decriminalize the drug. The trend is global: Canada recently joined Uruguay in fully legalizing cannabis, and Lebanon is also mulling legalization. Marijuana legalization has always had its opponents — including the alcohol lobby, which wants to protect its monopoly on legal intoxicants, and the prison-industrial complex, which fears a decrease in the number of nonviolent drug offenders who keep jail cells full. Now the reactionaries have another champion athwart history: former New York Times journalist Alex Berenson. 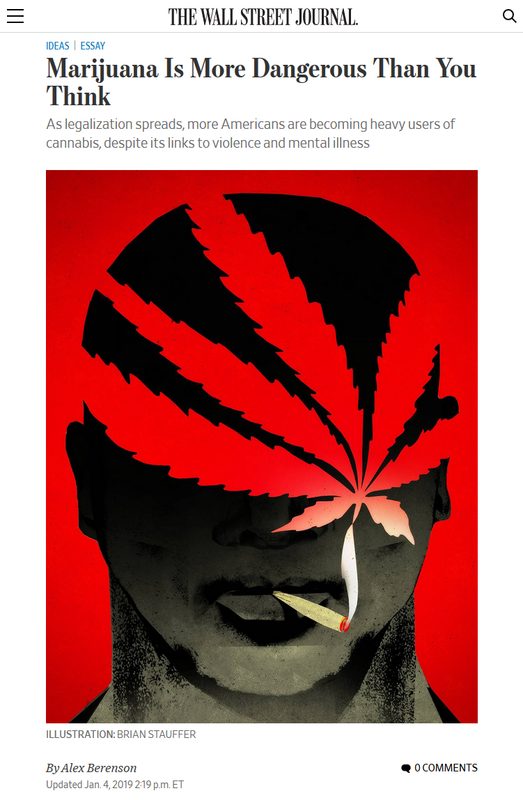 In a pair of op-eds in the New York Times (1/4/19) and the Wall Street Journal (1/4/19) promoting his new anti-marijuana book "Tell Your Children: The Truth About Marijuana, Mental Illness and Violence," Berenson — whose main literary success has been authorship of War on Terror fiction thrillers — flipped the news on its head. Legalization advocates, whom he calls corporate campaigners aiming to set up new businesses for profit, have sold the American people a false image of a perfect and absolutely safe product, and states are taking their cue from them and no one else. 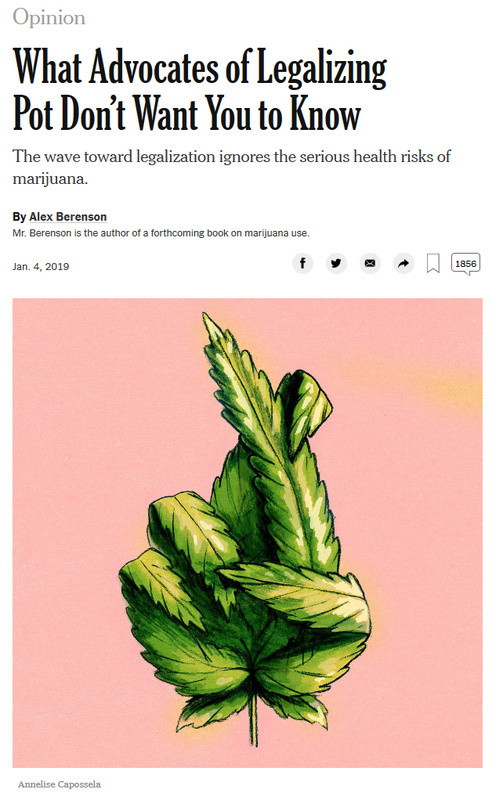 Jesse Singal in New York magazine (1/7/19) noted that Berenson’s claims about pot-provoked violence are grounded in egregious cherry-picking. 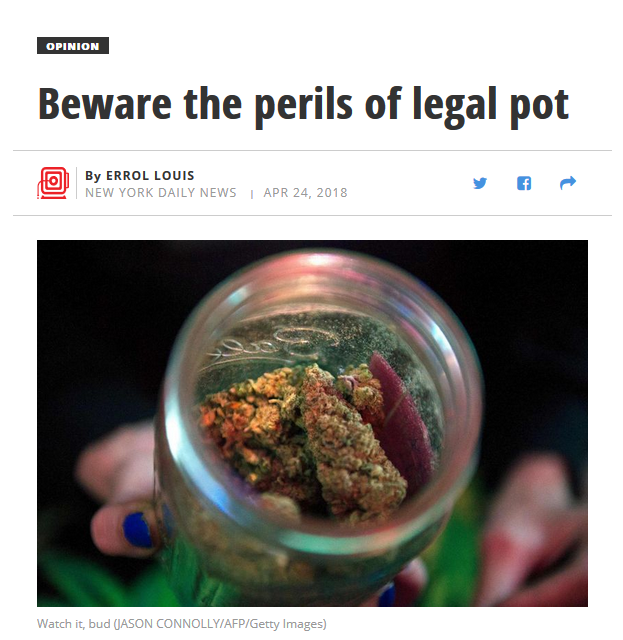 His Times op-ed asserts, “The first four states to legalize — Alaska, Colorado, Oregon and Washington — have seen sharp increases in murders and aggravated assaults since 2014.” But as drug policy expert Mark Kleiman told Singal, “Nothing interesting happened with regard to pot in 2014” — it’s just a low point in the national homicide rate that can be used to create the illusion of a meaningful uptick. In short, Berenson is good at cherry-picking a few crazy examples of where pot use has been linked to violence, with questionable evidence. In light of the mountain of evidence linking the legal drug alcohol to violence on a much grander scale, we have to ask: What is Berenson’s point, other than to denounce a peaceful transition to legal and regulated drug consumption? Many scientific experts in the field attribute any association between cannabis and psychiatric illness to shared vulnerability, not unlike the association that exists between tobacco use and psychiatric illness. Indeed, people with schizophrenia smoke tobacco at double or triple the rate of the public at large — but this provokes a debate over whether a craving for nicotine is a side effect of psychiatric symptoms, or whether the elevated use might mean patients actually find it helpful in self-medicating schizophrenia (World Journal of Psychiatry, 3/22/15), rather than an automatic assumption that correlation implies causality. As for Berenson’s point about corporate campaigners, there is a completely valid set of questions for those genuinely concerned about racial justice: how white entrepreneurs are poised to make millions while black and brown people remain in jail. Some states are insisting any profiteering be paired with release, but there is still painful irony in seeing former Republican House Speaker John Boehner flacking for corporate marijuana growers (New York Times, 4/19/18) while nearly 80 percent of people still in prison on federal drug offenses are black or Latino, according to the Drug Policy Alliance. However, this injustice is not Berenson’s concern. The backlash is driven in part because a whole generation of neoconservatives have rested their ideology on the idea that all the problems in the world are the result of unregulated individualism, and anything that loosens people’s freedom around drugs, sexuality, gender and race is going to unleash a Pandora’s Box of more relativism. They want to fight the marijuana legalization battle because it could lead to further progressive social reforms. But advocacy groups don’t view decriminalization as an acceptable compromise. They want full legalization, making marijuana a state-regulated and -taxed drug that businesses can sell and profit from. But it isn’t simply jail that black people fear in the drug war. Philando Castile was murdered by a police officer who claimed to have smelled marijuana smoke in his car during a traffic stop, and countless other black men who have become martyrs in the Black Lives Matter movement were initially accused of petty “quality of life” infractions. (Eric Garner was choked to death on the street because he was accused of selling “loose” cigarettes.) Berenson seems oblivious to the danger posed by anything that incentivizes interaction between cops and communities of color. Decriminalization would be a happy medium for white college kids, but not for everyone else. It’s not unusual for traffic violations to become a chance for the police to stop, question and search, and often arrest, people of color more disproportionately than white people. Once the pretext for the stop is there, there is a lot of discretion left to the officer. Berenson falls into a familiar trap of conceiving that the only way society can confront a public health concern is through some sort of criminalization, a symptom of our neoliberal hegemony — overlooking how many advocates for legalization actually do want the marijuana industry to be regulated, taxed and unionized. Of course, like any psychoactive substance, marijuana use has both positive and negative effects, all of which should be studied and monitored — which is also true about wine, butter or the vast majority of prescription drugs we take. A normal, functioning industrial state would regulate these things through the appropriate channels, like food and drug rules, environmental agencies and the like. But the erosion of the social safety net since the rise of Reaganism coincided with the intense militarization of policing in the War on Drugs, creating a world where the state is only strong when it’s punishing rather than protecting the public at large, with the latter seen as a socialist boondoggle. Berenson’s attachment to this Cold War logic suggests he has failed to demilitarize his mind. people know what they’re getting and it generates tax revenues for economic programs that replace the black market drug economy. You reduce the kind of organized criminality in the whole process. There still remains a lot of grossly inaccurate hysteria of any potential harms of marijuana, but even if there are secondary risks, those risks are much smaller than those of all kinds of legal activity. What’s good enough for alcohol — which is linked to domestic violence, vehicular fatalities and liver disease — is good enough for marijuana. But that logic probably wouldn’t have landed Berenson a book deal.